Google Fiber Project Installations Through The Kansas CitiesI have long been perplexed at how Google plans to make a profit with their Kansas City Fiber project. Originally the project was touted as an altruistic move by Google to really understand the underlying costs of deploying fiber in a large municipality. But as anyone who has been in the trenches can tell you, it is not the technology that determines the cost of a fiber deployment, but the tyranny of the take-up. If you only have an initial 10% subscription rate then the initial cost, regardless if the fiber is on poles or buried, can be as much as $6000 per home. If the take-up is closer to 50% the initial cost drops to around $1500 per home and if the take-up is close to 100% then the cost can be as low as $500 per home. The elbow in the curve for deploying fiber to the home is around 40% take up, at which it might, just might, be conceivable to make a return in your investment. But Google is competing head on with the local cable and telephone incumbents who are not going to sit on their hands and watch Google take away 40% of their market. Since their infrastructure has been paid for many times over through regulated rate of return on their basic service of cable TV and telephone, they can discount their prices to next to zero to prevent Google from making anywhere close to a 40% take up. So how is Google going to make a profit? In addition Google has announced that they plan to be a facilities based competitor rather than an open network provider. Many people may remember about 10 years ago in the .dot com boom a number of over builders announced plans to build fiber networks in competition with telecos and cablecos. Almost all of them went bust. An intriguing hint on Google's strategy is their plans to deploy fiber above the neutral wire on the poles. 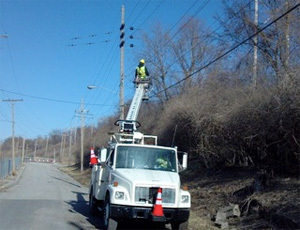 Although far less cluttered than being below the neutral wire, this means that specially trained or electrical utility crews must install the fiber. It means that any moves adds, or changes to the fiber splice boxes etc will require these same expensive, unionized crews. Generally when deploying a FTTH network, drops to individual homes are installed when a customer subscribes to the service, but with fiber installed above the neutral wire, it probably makes more sense to deploy all drops and splice boxes during the initial build out. This also drives up front costs. The only way for this type of strategy makes sense is if Google plans to fiber up every home from day one. Google has a habit of shaking up the world. Remember when it first offered free Gmail with one gigabyte storage? The critics claimed it could not be done or Google would go bust. But Google proved them all wrong. I suspect the same story is about to happen in Kansas City. Google will offer a basic free high speed Internet to each and every home, perhaps bundled with Google TV using their new set top box. A variety of premium services will also be offered for additional fees. I would not be surprised that Google decided to offer a basic 1 Gbps service to every home. This would clearly differentiate Google from the cableco or telco and make it almost impossible for them to compete without undertaking a massive investment themselves. Those who elected for the free service would have a Google side bar or screen splash on their TV or computers that are hooked to the Google set top box. Google would then hope to make money by extending its current business model largely through Google TV. Google may make extra money by also making their set top boxes WiFi 2.0 compatible so they can offer a city wide wireless network as well — much like Free is doing in France. France's Free network is probably the closest model that Google plans to emulate. However even with Google TV I think Google is going to have a tough time making money. To pay for the fiber alone, they will need to earn $10-$20 per month from each household over the next 5 years. I don't think highly selective advertising via Google TV will be enough. Negotiating all the TV rights and channel offerings will also be a challenge. The other potential area for Google to make money is operating as an ESCO (Energy Services Company). Google, as well as Microsoft and many other companies have tried to interest customers with tools to monitor their energy consumption. But customers are not interested in saving energy — if they did everyone would drive at 30 miles per hour, as everyone knows gasoline consumption climbs significantly the faster you drive. Energy prices are also likely to drop because of abundance of gas and a surplus of electrical grid power. So rather than enticing customers to monitor their energy Google, in partnership with the local utility, could offer to peak manage the customer's power usage, by briefly turning off air conditioners and hot water tanks. They could also install smart thermostats and other devices to further reduce energy consumption. The money in the energy savings would use to pay for the fiber or premium services, rather than being returned to the customer as piffling amount of energy savings. Bundling broadband with energy is the huge revenue opportunity for Google. The energy market has virtually remained unchanged since the 19th century. The energy market is many, many orders magnitude larger than the advertising market. Rather than trying to save customers a few dollars a month in energy, it would be far more effective to offer consumer something more tangible and with a higher perceived value such as free high speed Internet. Gigabit fiber is already going in Chattanooga. The infrastructure funding worked differently, since the fiber is also being used for electrical infrastructure purposes. Local Time: Friday, April 19, 2019 05:29 AM PDT – Page Load: 0.4470 Sec.